The Banquet Facility at the Boulder Creek Clubhouse utilizes a beautiful blend of the Nevada desert and the lush, green surroundings of the Boulder Creek Golf Club to provide a unique ambience for special events. We can host weddings, parties, conventions, business banquets or any special outing for your family or organization. 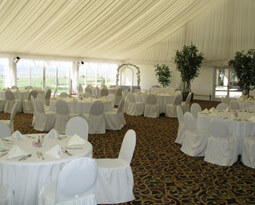 Our facility includes an 8,000 square foot pavilion tent that overlooks the beautiful golf course and lake. The pavilion tent can accommodate up to 350 guests. Our personalized meal and beverage packages are designed to accommodate your needs. Your event can be further enhanced by our experienced event facilitator who is ready to provide you with helpful information on a variety of full service packages for your special function or event. Click here to view the specials that we currently have available for your next business outing.